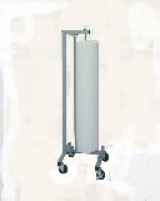 Cutting Equipment SINGLE ROLL VERTICAL STAND Industrial Sewing - SOUTHWEST SEWING MACHINES, LLC. Assembled Dimensions: Height is size ordered plus 8″ (add 3 1/2″ for casters). Base is 14″ x 14″.